1X10^6 Raji cells were stained with 0.2ug CD86 antibody (13395-1-AP, red) and control antibody (blue). Fixed with 90% MeOH blocked with 3% BSA (30 min). Alexa Fluor 488-conjugated AffiniPure Goat Anti-Rabbit IgG(H+L) with dilution 1:1000. CD86 (also known as B7.2) is a costimulatory molecule belonging to the immunoglobulin superfamily. Primarily expressed on antigen-presenting cells (APCs), including B cells, dendritic cells, and macrophages, CD86 is the ligand for two proteins at the cell surface of T cells, CD28 antigen and cytotoxic T-lymphocyte-associated protein 4. Binding of CD86 with CD28 antigen is a costimulatory signal for activation of the T-cell. Binding of CD86 with cytotoxic T-lymphocyte-associated protein 4 negatively regulates T-cell activation and diminishes the immune response. 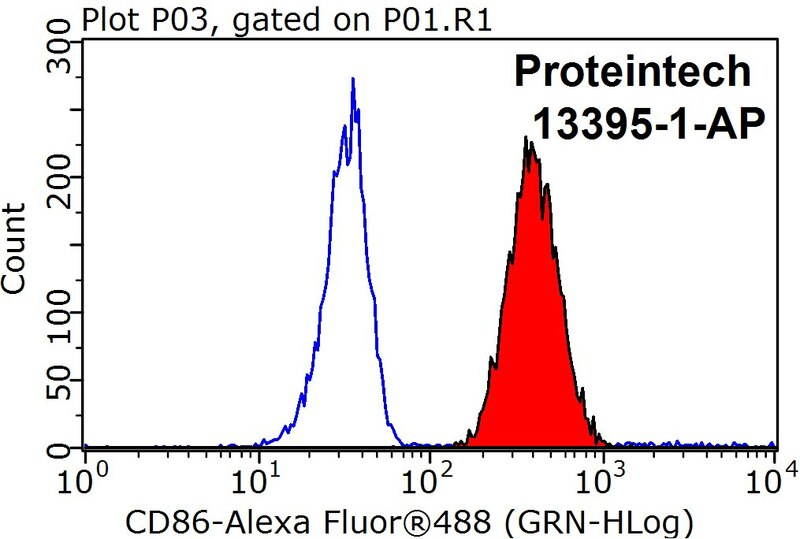 This antibody detects a band of approximately 65-70 kDa, consistent with glycosylated form of CD86 (PMID: 8592066, 21849678). Treadmill Exercise Exerts Neuroprotection and Regulates Microglial Polarization and Oxidative Stress in a Streptozotocin-Induced Rat Model of Sporadic Alzheimer's Disease. Cathelicidin-WA polarizes E. coli K88-induced M1 macrophage to M2-like macrophage in RAW264.7 cells. Hydrogel derived from porcine decellularized nerve tissue as a promising biomaterial for repairing peripheral nerve defects. TSG-6 attenuates inflammation-induced brain injury via modulation of microglial polarization in SAH rats through the SOCS3/STAT3 pathway.